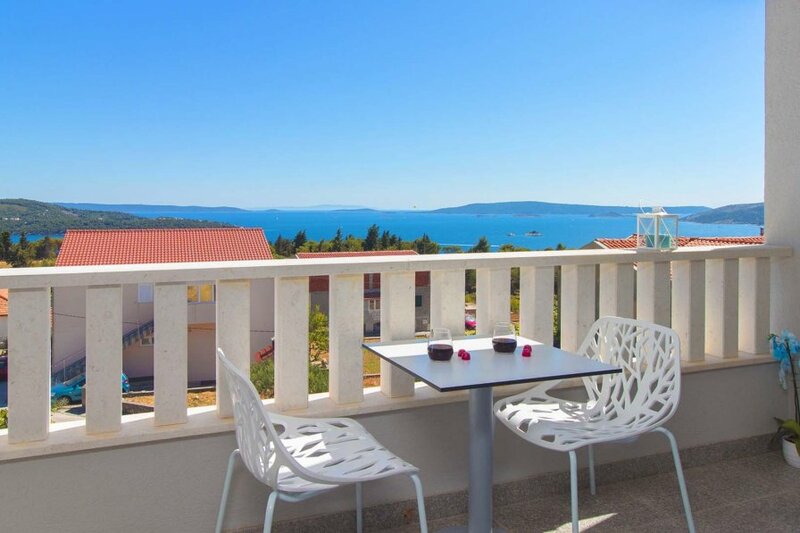 Studio apartment Vista 5. is a modernly furnished apartment located in Seget Donji, just 3 km away from the UNESCO protected center of town Trogir, 8 km away from Split airport and 500 m away from the sea and the nearest beach. Studio apartment Vista 5 is located in a modern apartment building, completely renovated in 2017, which consists of 7 apartments covering the first, second and third floor of the building. Each apartment has a magnificent view spreading over the sea and the archipelago of nearby islands and islets. Studio apartment Vista 5 is situated on the second floor of the building, spreading on 38 m2 of living area and can accommodate 2 persons. The apartment consists of a large double bed, 1 bathroom with shower and well equipped kitchen. The apartment is equipped with SAT-TV and has access to a seaview balcony with outdoor furniture. Guests of apartments Vista have access to a large shared outdoor swimming pool (70 m2) with massage tips and a waterfall surrounded by sun loungers, ideal for relaxing in the hot summer days. Large sliding glass door leads from the pool area to the common recreation/game room on the ground floor equipped with billiard table, table tennis, table football and a Playstation. Two half-baths are located around the pool area, while 2 additional half-baths are available in the recreation room. Those looking for a more active vacation also have bicycles on their disposal, free of charge. Studio apartment Vista 5 is air conditioned and equipped with Wi-fi, SAT TV, common outdoor barbecue, iron and ironing board, stove, oven, hood, refrigerator, freezer, electric kettle, coffee maker and hair dryer. Laundry service is available on request. Baby cot, high chair, safe and microwave are available on request. The property offers free parking.